The five jurors for the 42nd annual Philadelphia Museum of Art Contemporary Craft Show had their work cut out for them, selecting 195 artists from a total of 876 applications. Per tradition, the show has a number of special add-ons, including the guest artist program, which this year features a cohort of twenty-six craft artists from Germany. As the show gets under way at the Pennsylvania Convention Center, a bounty of beauty and technical expertise awaits those who pass through its doors. Once again the PMA Craft Show shines a light on some of the best and brightest in American art and craft in a dozen different categories. Fine art etcher Marina Terauds’s paper pieces stand out for their exquisite detail and precise lines, whether it’s a custom-made ex libris or a drawing of Queen Anne’s lace. A Latvian by birth, Terauds studied graphic art at the Art Academy of Latvia and art pedagogy at the University of Latvia. After completing her studies she taught art and art history and worked as an artist-animator at the RIJA film studio in Riga. She currently lives in North Branch, Michigan. Terauds uses original hand-cut copperplate intaglio prints and handmade paper as a basis for her three-dimensional compositions. She is a fantasist, a maker of inventive assemblages that sometimes bring to mind the work of Joseph Cornell. 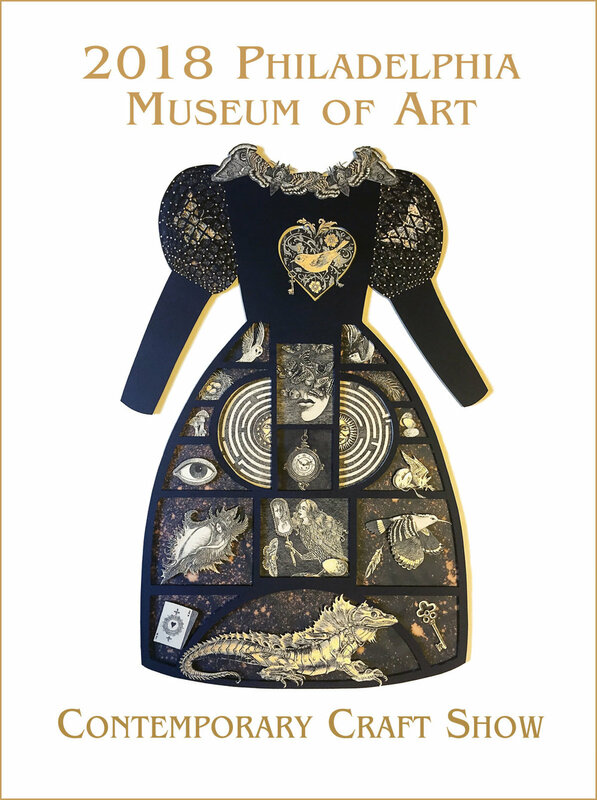 In one recent piece, a dress form is decorated with all manner of evocative imagery: a vintage clock, a mirror-holding bird-woman, an iguana, mushrooms, and butterflies. Another newcomer is Lindsay Locatelli from Denver, one of fourteen “emerging” artists selected for the 2018 edition. 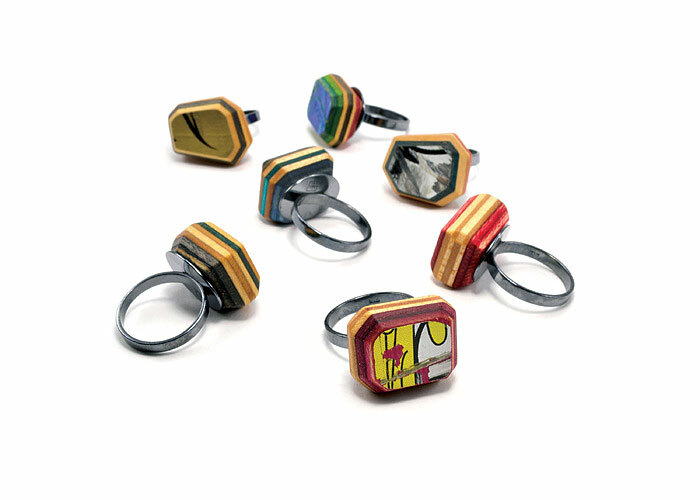 The Philadelphia show has been at the top of her list for a while and she is excited to be going to the big dance to exhibit her contemporary art jewelry. Diane Harty, a fiber artist from Frisco, Colorado, will be making her second trip to Philly, with some of her straw hats in various shapes and sizes ready for display, as well as chenille and felt headwear for colder weather. She employs about a dozen different kinds of braid in her hats, each one lending itself to a certain hat style. Harty recently obtained a few rolls of buntal, a fine white fiber produced in the Philippines from the leaves of the talipot palm. She has used the fiber to create cocktail hats. Another fiber artist, Deborah Cross from Freedom, California, has been to the Philadelphia show off and on over the past twenty years. She always looks forward to the enthusiastic reception given the artists and the high level of appreciation shown by the people who visit her booth. To achieve her complex designs Cross hand dyes and overlays pieces and appliqués silk fabrics. Her husband and partner, Gordon Heinel, helps with weaving and dyeing. The pair won the Ornament Magazine Prize for Excellence in Art to Wear at the 2013 show. This year Cross will be showing her newest limited edition wearables. She loves working in silk and wool, with houndstooth among her favorite fabrics. 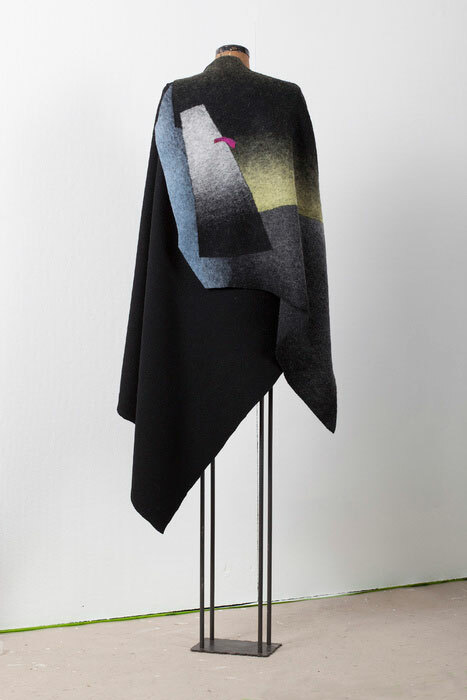 Indeed, she considers black and white to be “the most flattering fabric to wear.” On each of her new pieces she has airbrushed a gradation of black to striking effect. Some of the pieces also feature a stenciled discharge paste design. Another couple in artistic cahoots, Nancy McCormick and Paul Monfredo have made around seven trips to Philadelphia over the years, bearing with them the fruits of their studio on Mount Desert Island on the coast of Maine. McCormick looks forward to seeing the work of fellow artists and admires the way the museum’s Women’s Committee organizes the show. McCormick and Monfredo have been collaborating on decorative mirrors going on thirty years, inspired by images from the natural world, illuminated books, art history, and architecture. Their joint practice entails many steps, from building the frame to applying tempera paint. Monfredo handcrafts the panels from basswood, poplar and other woods, then applies several layers of hand-mixed clay, called “bole,” which he sands and polishes before applying gold leaf. McCormick creates the ornamental designs and paints them using tiny brushes. Elegant trees and stylized fish appear in several new pieces. Kasten’s pieces often have a weathered look as if they had been discovered at an archaeological site. This appearance of what she calls “organic deterioration” evokes “the cycle of life, death, decay.” She embraces a minimal aesthetic she first encountered as a student of British ceramist Rupert Spira in 2000. The Nantucket-born artist has never lost her sense of the inherent earthiness of her medium, from her years in Nepal developing a stoneware production facility to the studios she established in Oakland, California, Mount Rainier, Maryland, and the St. Croix River Valley northeast of Minneapolis, where she works today. 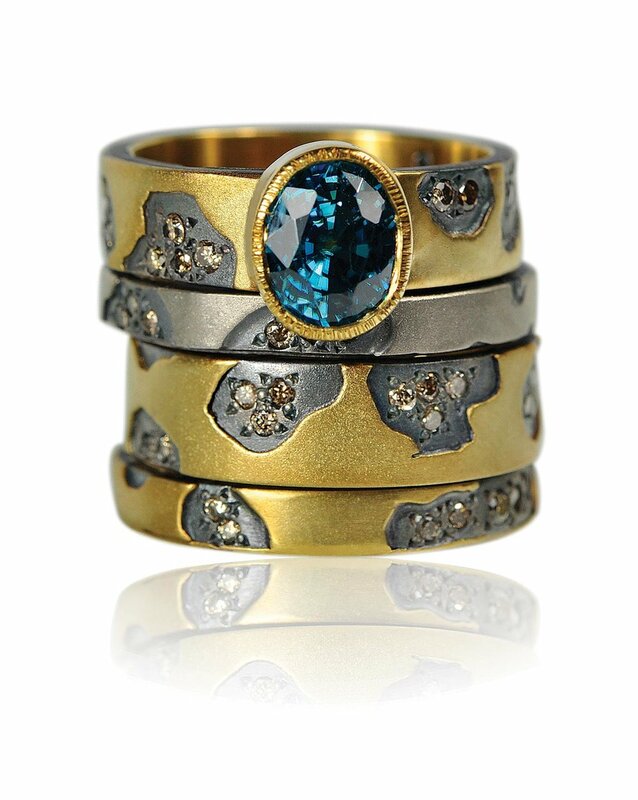 Another jeweler, Seung Jeon Paik from Annandale, Virginia, will be returning for his second showing in Philadelphia. He has fond memories of meeting collectors and gallerists and receiving helpful feedback from them. Among Paik’s offerings are brooches and pendants made from eighteen karat gold and sterling silver. 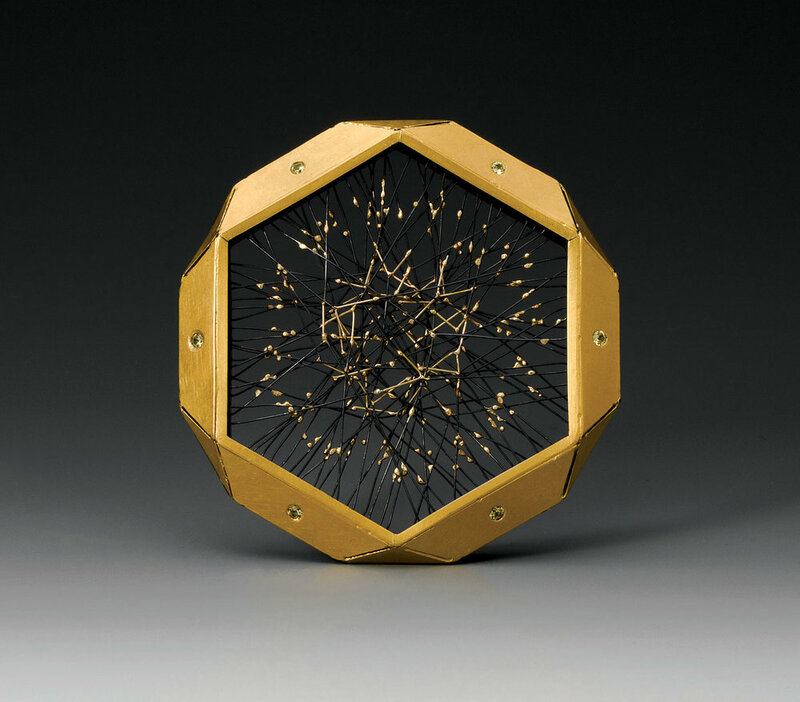 He has turned to the cosmos for inspiration, creating “naturally occurring galaxy and swarming forms” through the representation of “small particles.” And as with Lyons, technology and tried-and-true techniques go hand in hand: Paik uses traditional granulation, Rhino 3D CAD and laser welding to produce his ornaments. Roper Lyons is showing jewelry and larger objects: goblets, cups and bowls. Of note are several examples from her current series of Women’s Work goblets, “reimaginings” of what she calls the “historical trope of decorative female figures used ornamentally in sterling hollowware.” She turned to a mix of digital technologies and traditional methods to create these pieces. She used CAD to model the figures and cup frameworks, which were printed in resin on a 3D printer. She then made molds and cast the parts in sterling silver. The final step entailed enameling them by hand, employing plique-à-jour, a vintage method for creating a glowing surface. Meanwhile, Roper Lyons’s recent jewelry, in eighteen karat gold and enamel combined with gemstones, is inspired by outer space. Her cloisonné technique allows for subtle layering of colors over a textured base while creating areas that flash and glint. William Alburger from Barto, Pennsylvania, won the Best New Artist award at last year’s craft show, earning him an automatic invite to the 2018 gathering. He calls himself a “repurposing eco-artist,” creating art from wood rescued and reclaimed in his part of the Delaware Valley. Most of his pieces are “eco-art” sculptures that can be displayed on the wall, but can also serve as shelf or mantel. 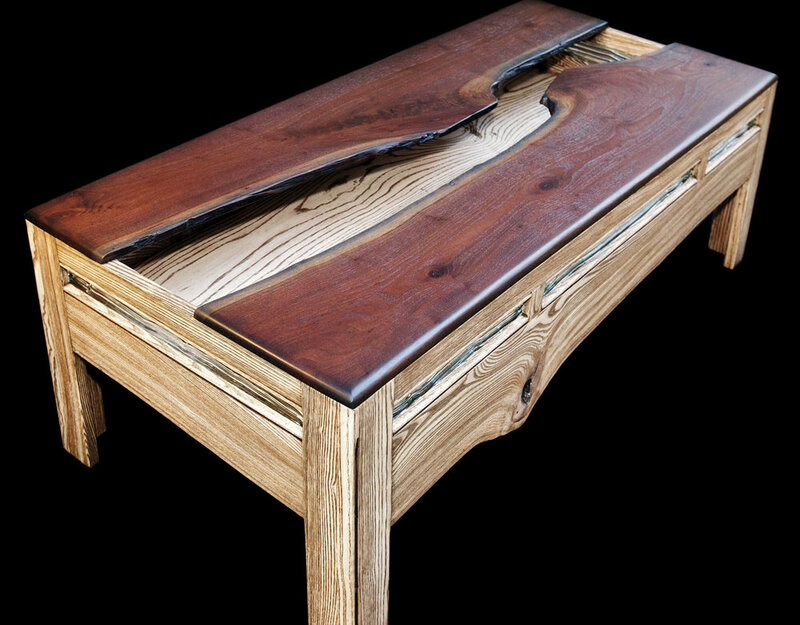 He makes console and coffee tables too. Like many of the artists in the Philadelphia show Alburger is passionate about his materials and has made a personal connection to them. In this regard, Alburger and company fulfill one of the main criteria of the jurors, as noted by one of them, Perry Price, executive director of the Houston Center for Contemporary Craft, in an interview for the show. “At this level,” Price states, “the mastery and accomplishments of the individual artists is almost a given, but makers who I tend to recognize with higher scores are the ones who draw me into their work by virtue of the originality and authenticity of their voice as artists.” That’s the common thread here: the original and authentic voices of these remarkable people. Carl Little has previewed the Philadelphia Museum of Art Contemporary Craft Show for Ornament before and loves the opportunity. “The show’s remarkable variety and the stellar quality of the work makes it a daunting task to select a few craft artists to highlight,” he notes. Upcoming for Ornament is his review of “Uneasy Beauty: Discomfort in Contemporary Adornment” at the Fuller Craft Museum. His third collaboration with his brother David, Paintings of Portland, came out in June. He also contributed an essay to Nature Observed: The Landscapes of Joseph Fiore. Little lives and writes on Mount Desert Island in Maine. Philadelphia Museum of Art Craft Show, Pennsylvania Convention Center, November 10 - 13, 2016. Visit pmacraftshow.org for more information. Each November, Philadelphia becomes the epicenter of the nation’s craft world for four exhilarating days known as the Philadelphia Museum of Art Craft Show, as hundreds of artists and thousands of enthusiastic and discerning viewers flock to the city to immerse themselves in the best that American craft has to offer. This year marks the fortieth anniversary of the PMA Craft Show, and it promises to be a landmark exhibit. From more than a thousand applicants, the five jurors have selected one hundred ninety-five artists from thirty-four states. On display will be work representing every major craft medium, including baskets, jewelry (precious and semiprecious), metal, glass, fiber (wearable and decorative), leather, wood, furniture, paper, ceramics, and mixed-media creations. A separate category for “Emerging Artists” helps relative newcomers bring their work to a wider audience. Similarly, the special “Craft-U” section allows students and recent alumni from Temple University’s Tyler School of Art, the Moore College of Art and Design, Kutztown University, and Savannah College of Art and Design to display and sell their work at one of the country’s premier venues for fine crafts. The Craft Show is organized and presented each year by the Women’s Committee of the Philadelphia Museum of Art as a major fundraising event for the institution. Last year’s show generated around $845,000, and since the first show in 1977 more than $11.7 million in proceeds have been raised to fund every aspect of the museum’s mission, including education, acquisitions, exhibitions, programs, and renovations. As the first retail craft show to be organized by volunteers for the benefit of a nonprofit organization, the PMA Craft Show has become a highly successful model for others to follow. 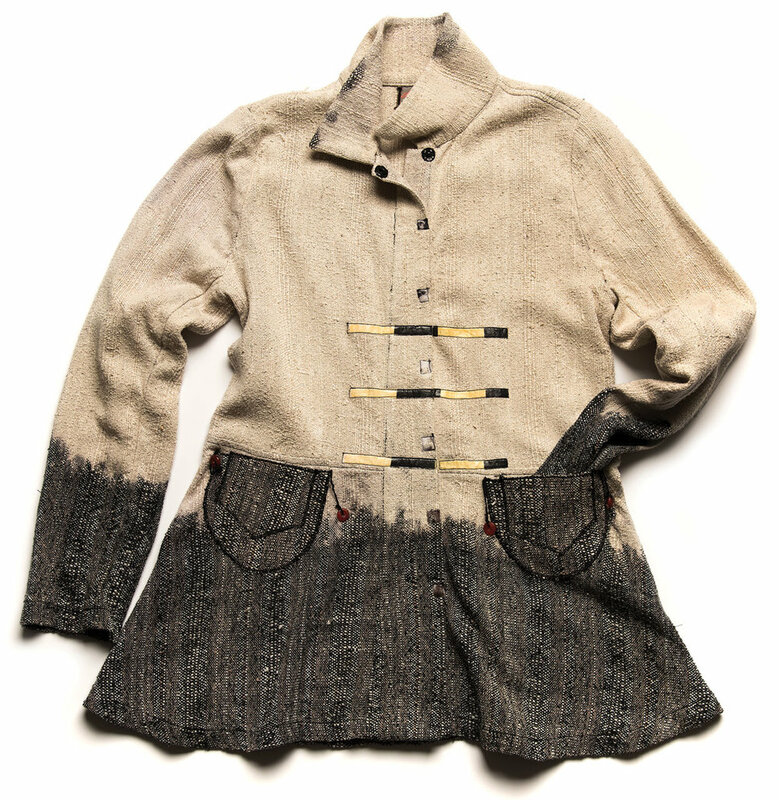 In the process, it has also done much to promote contemporary American craft. Regular attendees will find many familiar faces in this year’s line-up, including ceramicists Cliff Lee and Bennett Bean; jewelrymakers Namu Cho, Rebecca Myers, and Steven Ford and David Forlano; fiber artists Elyse Allen, Andrea Handy, and Ping Wu (winner of last year’s Ornament Award for Excellence in Art to Wear); basketmakers Christine and Michael Adcock; and mixed-media artists Roberta and David Williamson, who will be participating in their thirty-fifth PMA Craft Show! The show’s organizers, however, are proud to point out that more than a quarter of this year’s entrants are first-time exhibitors, a testament to the rising generation of skilled artisans. 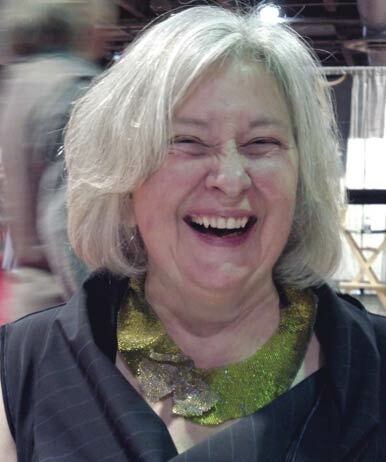 “This year we will have fifty new artists,” said Gwen Goodwill Bianchi, chair of the 2016 Craft Show. “It’s very exciting to have so much new work as we celebrate the show’s fortieth anniversary! 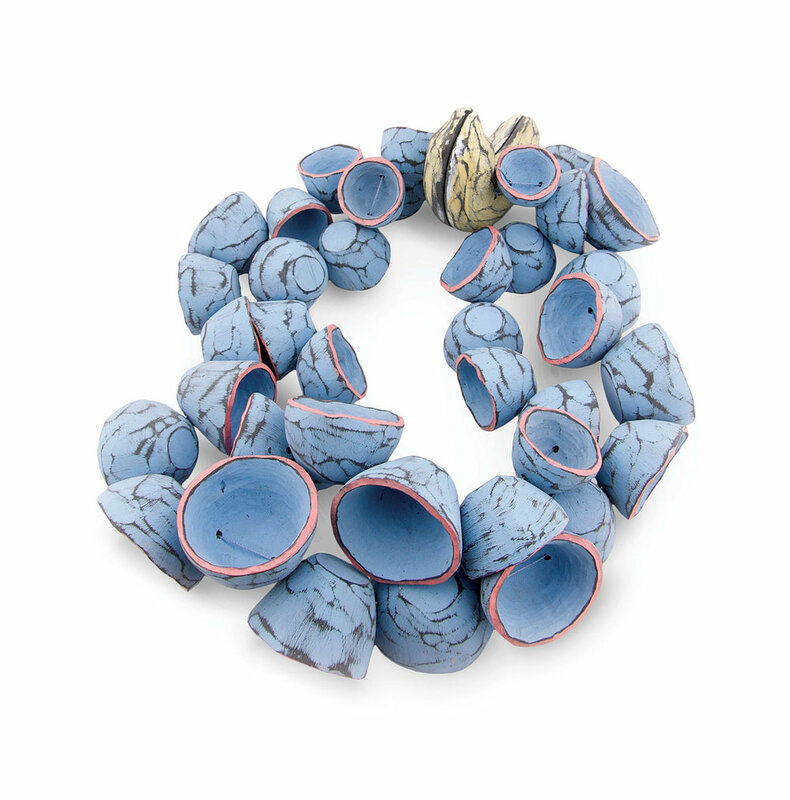 That keeps contemporary craft fresh and moving forward.” Bianchi has been a member of the Craft Show Committee for ten years, and a member of the Women’s Committee for the past eight years, but this is her first time chairing the show. “The biggest surprise has been how the younger, tech-savvy generation continues to embrace the relevance and importance of handmade work,” she said. Other “Emerging Artists” this year include ceramicist Melodie Grace of Nashville, Tennessee, who, according to the artist’s statement, combines “wheel-thrown, handcarved and etched elements with both traditional and naked raku” to create pots whose textures often evoke natural materials such as pine cones. The surfaces of many of her vessels feature sharply defined images of trees, blossoms, leaves, and birds whose colors are created exclusively by smoke during the firing process. Glass artist Robert Coby of Cleveland, Ohio, similarly evokes landscape in his handblown and carved vessels. His Topography series, for example, features egg-shaped vessels of molten glass in various hues, into whose surfaces the artist etches intricate patterns of concentric lines resembling the elevation markings on topographical maps. Coby then carves away portions, creating crevasse-like openings bounded by serrated crystalline edges, beneath which lie the exposed luminous interior surfaces. One could easily imagine each vessel as a globe-egg that incubated some fantastical creature, which has now hatched and left behind its multicolored shell for us to admire. Another artist who evokes the fantastic in his work is first-time exhibitor David Winigrad of Penn Valley, Pennsylvania, who specializes in the wind-activated kinetic sculptures known as “whirligigs.” Winigrad earned a BFA in two-dimensional design from Carnegie Mellon University in Pittsburgh and spent three decades working in advertising. His mother, Etta Winigrad, is a world-renowned ceramic sculptor, but David told me that he came to kinetic sculpture “almost by happenstance” when he got some woodworking tools from his brother and began experimenting. Winigrad’s inspiration for each whirligig “almost always comes from the wood. I gravitate to burls specifically, the deformed growths found on various species of trees... Each burl has a unique grain pattern and often contains voids, bark, spiky caps, and live edges.” These irregular features allow him “to contrast the eccentricities of the burl with the precise geometries I impose on the overall shape.” Along with the wooden elements, which range from ebony, maple, cherry, and walnut to osage orange and wild almond, he incorporates jade, stones, bone, feathers, crystals, coral, fossils, and other materials into these truly mixed-media creations. Participating in his second PMA Craft Show is Eben Blaney of Edgecomb, Maine, who has been making custom furniture for twenty years in the studio he built for himself in this small coastal town. Blaney, whose father was a boat-builder in nearby Boothbay Harbor, “resisted being a woodworker, anything to do with wood, for a long time,” he related to me during a studio visit in late August. After attending Hofstra University and the Portland School of Art (now the Maine College of Art), he went through a “soul-searching time” during which he “rolled around a lot.” This he did in a very literal way—by riding a bike all the way across the country. Eventually Blaney both found his way back home and embraced woodworking as his medium. The bike now hangs from the ceiling of the workshop, a reminder of his earlier nomadic life. He and his wife, a massage therapist, have their living quarters below the workshop, and she has a separate studio for her business nearby. Blaney’s first PMA Craft Show outing, in 2014, was “my best show ever, it was incredibly heartening,” he told me. He was particularly impressed by the “caliber of everybody else there,” but also by the sophistication of the viewers. “Philadelphia is a really well-educated population, in terms of furniture. They know what they’re looking for.” The city does indeed have a long historical connection to fine furniture-making, stretching from Colonial times through to more modern figures such as Wharton Esherick (1887–1970), a key inspiration for the resurgence of the craft following World War II. Echoes of Esherick’s aesthetic sensibility can be seen in many of Blaney’s elegant pieces, which combine the crisp geometries of mid-century modern design with a deep respect for the organic qualities of the materials. An example is his Cormorant, a tall, slim hall table fashioned from walnut and ebonized tiger maple. “This felt very bird-like to me from the beginning,” he said. “It’s one of my favorite pieces because I was able to make it thinner than what you’re used to seeing.” On the in-progress version he showed me in the studio, the smooth, black surface of the elliptical tabletop was interrupted by the irregular edges of a knothole, a reminder of its origin in nature. Like many of Blaney’s pieces, the Cormorant also features exposed mortise-and-tenon joints. “I like to have some evidence that it was done by hand,” he said. David Updike is an editor and writer living in Philadelphia. A regular contributor to Ornament, he most recently reviewed the “Immortal Beauty” exhibition of garments and textiles from Drexel University’s Robert and Penny Fox Historic Costume Collection. 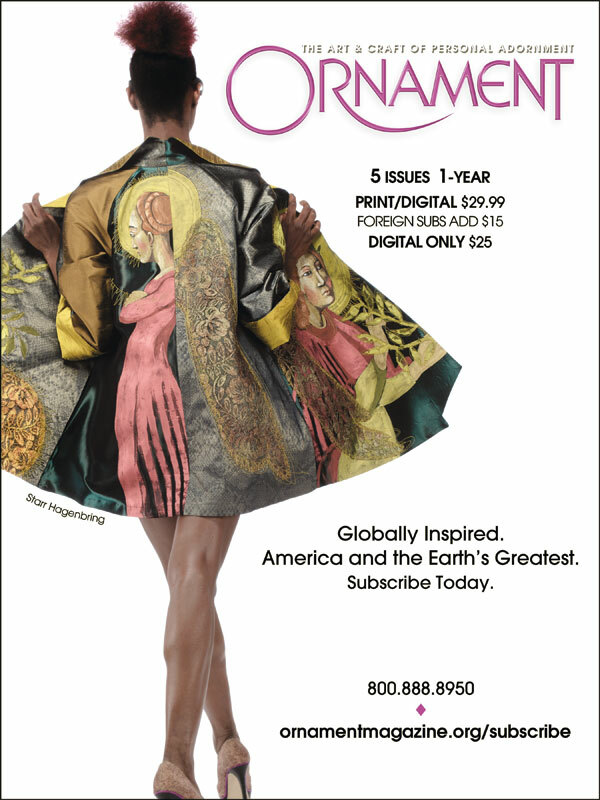 In this issue, he previews the 2016 Philadelphia Museum of Art Contemporary Craft Show, which celebrates its fortieth anniversary this year, and found in the process encouraging evidence for the continued relevance of fine, handcrafted objects in our increasingly digitized world. Updike has, in addition, contributed articles on jewelry artists Rebecca Myers, Namu Cho and Michael Manthey in past issues.